Tuck Pointing, Brick and Chimney Repair Toronto | Turnbull Masonry Ltd > Blog > Blog > How Often Does Toronto Brickwork Require Maintenance? Are you keeping up with your Toronto brickwork maintenance as needed? There are a few important repairs and maintenance tasks all bricks require at some point, such as cleaning, sealing and repointing bricks, as well as preventing and checking for water damage. 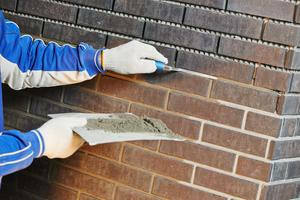 You may think bricks are made to last forever, and they pretty much are, but only if given the proper TLC. You increase the life of your brickwork while maintaining a fresh and clean appearance by simply keeping up with basic maintenance and repairs. Here’s an overview of 5 important Toronto brickwork maintenance tasks to help you determine if your bricks are in need or good to go. Bricks should be cleaned as needed. Bricks take longer than most materials to show signs of dirt and grim build up. Still, bricks should still be inspected for signs of damaging stains such as mold. This way the mess can be cleaned up before it has a chance to create greater issues. Efflorescence is another common masonry eyesore that can be cleaned up. The actual source of the white powder-like build up needs to be pinpointed in order to stop the problem from reoccurring. Regularly look over brickwork for signs of mold, efflorescence, and dirt build up. Sometimes the issue can be addressed with some simple DIY scrubbing power, other times you may need to call in a professional to clean brickwork. Sealing bricks is important in order to keep water out. Water is one of the greatest contributors to brick damage. By helping to keep water out you are doing your bricks a great favor. If properly done, you should only need to seal your bricks once every 10-years or so. Instead of following a specific timeline, it’s more important to look at the structure and let it tell you when it needs to be resealed. It’s important to consult with Toronto masonry professionals instead of tackling this one yourself, as you need to use the right sealant for your bricks in order to reap the full benefits. Applying sealant isn’t the only way to keep water damage out. There are two key forms of water damage, splash back and rising damp. If your bricks are regularly exposed to either type they are prone to serious damage. Rising damp is when groundwater builds up from below, creating a white ‘tide line’ visible on bricks after the water dissipates. The water will evaporate but this solidified line of salt crystals will not, and eventually it will contribute to the breaking down of bricks and mortar. Splash back is when rain directly beats against bricks. When brick is consistently wet it is more susceptible to damage, especially from freeze and thaw cycles, which are common in Toronto’s often-unpredictable winters. Be on the lookout to ensure neither form of water damage is happening to your bricks. If they are, new drainage systems, awnings, or other architectural elements may need to be added in order to prevent future damage. Also, any damage that has already taken place must be corrected. If bricks are painted they will require unique maintenance, especially if you want to remove the paint. This is common, as painting brick walls became popular in the early 1800’s, but modern homeowners often want to remove these layers of paint. Never let someone sandblast paint off, this can cause serious damage to bricks, especially if bricks were produced prior to the turn of the century. Sandblasting removes the kiln-hardened outer shell of the brick, which leaves brick more susceptible to water damage and destroys the naturally beautiful, smooth outer surface. If you are considering paint removal you should always consult with a professional. Repointing is an important maintenance task for all masonry structures as soon as mortar starts to break down. The mortar is designed to break down over time, as it takes on a lot of impact for surrounding bricks or stone. As a result, once the mortar shows signs of holes, cracks, or feels crumbly or soft to the touch it needs to be repointed. Otherwise, the surrounding materials will begin to incur damage, eventually putting the entire structure in jeopardy. The repointing process includes removing old mortar and replacing it with an appropriately mixed replacement mortar. The replacement mortar must match the original mortar in context and color in order to match as well as provide the proper support. Repointing does not need to be done very often, maybe once every 5 to 10 years. This largely depends on exposures to weather, what sealants are used, and other factors. Turnbull Masonry is happy to help extend the life of your brickwork with our superior Toronto masonry maintenance and repairs. Contact us today for a free quote!